Downey Daily Photos: Throw away the key! In her last post, Pam talked about the Seine and how it somehow motivates people to action—in Pam's post, the action was jogging. Here, you see the motivation is the demonstration of their love. One of the things we have written about before was the "love locks" that get attached to fences, gates, bridges, and parts of bridges.In this case, the locks you see pictured here are attached to a metal ring that is in the wall that borders the Seine alongside Notre Dame. 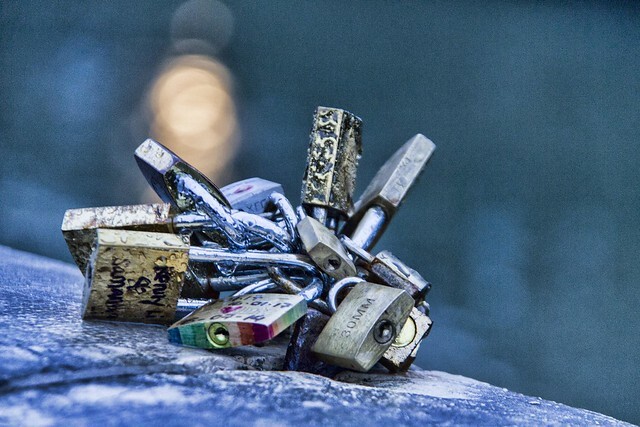 The story is that people show their commitment to their loved one by attaching a lock with their names on it and throwing the key into the river; as a sign of their enduring love.